It's true that the conventional English phrase "I'm sorry" is often used in unapologies whose content amounts to saying "I'm sorry that you've chosen to take offense at something that was not my fault and anyhow was not wrong and maybe didn't even happen at all". And it may be true that Filipino conventional unapologies are more transparently not actually apologies at all — perhaps some readers who know Filipino can comment on this. But surely Tagalog would allow the president to say things like "I made a mistake", or "I failed to prepare adequately for this situation", or "I ask you to pardon me for what I did (or for what I failed to so)", if he wanted to do so. Most Filipinos use the word 'sorry' ad Mr Cruz's argument is a bit thin since the Philippine president a) is very fluent in English and b) would communicate with his opposite number in China in English. In Malay, there's no single word for 'sorry' so you say minta maaf, which means '(I) ask forgiveness'. The idea that lacking a single word for something means the concept doesn't exist in a language is fun. 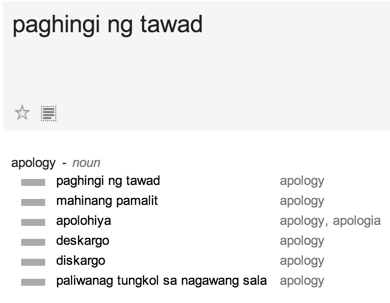 The Google translation for 'apologize' that you've gotten literally means 'ask for forgiveness'. When Mr Aquino's mother was president I was told that she gave speeches in 'deep Tagalog', or Pook Tagalog, which few ordinary Filipinos now understand and didn't then. I might be off target here but it occurs to me that sorry and apology have only relatively recently (19th and 18th centuries respectively) had their associations with accepting fault anyway. My, rather unscientific, guess is that there is a tendency for languages to develop words for sorry primarily without admitting fault. For example, in French, desolé, in German, entschuldige, and in Hungarian, elnészést all have elements of avoiding responsibilty at their root and one could as easily say that these languages have no word for sorry – in the sense of admitting fault. These sound somewhat old-fashioned. But those who speak Tagalog understand them. In everyday use of course, sorry or pasensya na is more common. Which, indeed, is the case with english "excuse me" and "forgive me" as well, which are certainly second-person phrases, "not a single word" and contain responsibility avoidance. That the word that has ended up as most forceful in the apology stakes in English is first-person and expresses putting yourself down is mere coincidence. 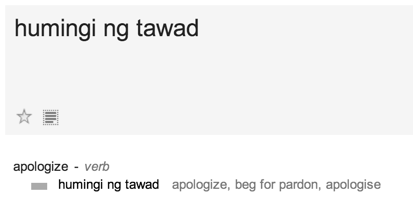 "Pasensya" is not equivalent to sorry, it means to have patience, to "bear with me" , Patawad is a more appropriate Tagalog word. The more acceptable explanation is that the term "patawad" is a very serious word it denotes complete humility and acceptance of guilt. It is not as common as the English term "sorry". Not long ago President Arroyo made an " I'm sorry" statement but was not accepted as well. Patawad is a very personal word it is an extension of self of is therefore appropriate when committing a personal fault. The Tagalog language is not peculiar its just endowed with so much cultural implications like many other language,it may be inferior in being technically specific but is far superior in describing emotions and other inter-relational ideas. Language has nothing to do saying sorry sometimes a simple bow of the head will do, accepting mistake is all about character. I don't think French desolé has an avoiding responsibility meaning. It means '(I am) saddened'. 'Excusez-moi' or 'Pardon' is the 'Excuse me' equivalent. It seems to me that among English-speakers there has been a growing tendency over the last several years to focus on the surface semantics of apologies, and judge them not good enough if they have even the faintest whiff of blame-shifting. In some circles you can no longer say "I'm sorry if I offended you" without incurring a scolding about how you ought to have said "I'm sorry that I offended you". I think Jeremy Wheeler makes a good point that pure self-blame is not necessarily a feature of apology formulas, and is not required for apologies to be true and heartfelt. How you apologize in a language is a fact about the language and not a fact about its speakers' feelings. Erica: But people are right to criticise the weasely formulation "I'm sorry if I offended you." Why qualify "I'm sorry" at all? Adrian, if I were to say to you, "There's Coke in the fridge if you're thirsty", would you take it to mean that if you were not thirsty, the Coke would not be there? English conditionals can be used in ways other than their most prototypical sense. "I'm sorry if I offended you" doesn't imply that offense was not taken; it is in fact an acknowledgement that offense was taken. Maybe that will satisfy the semantic doubters. I find it odd that the author of the article (quoted in the original post) seems to think "I'm sorry" expresses fault. Not directly. Only implied by context. "I'm sorry" said to someone who lost a loved one expresses regret and contains no implication of fault on my part. "I'm sorry" when said about something I personally did no more is a direct expression of fault, it seems to me; fault is merely impled. If I add what I did, "I'm sorry I said that" for example, only then am I admitting fault. Why the whole content of an idea must be contained in a single word or a very short phrase? The idea that there is a language in which it is not possible to express remorse is somewhat nutty. And the focus on "magic words" is also somewhat weird. What if I say "I sincerely apologize for my actions and ask for you forgiveness, it was my fault and I bear full responsibility for what happened" and keep crossed fingers behind my back? Pardon the bad editing on my comment a couple above this one. It seems to be a sociolinguistic fact in English, at least, that men tend to construe "I'm sorry" as implying fault more often than women do. If I were consoling someone over a loss I'd say something like "That's terrible," not "I'm sorry." English has no word for sorry either! Sorry is etymologically the same as sore, and saying that you're in pain about something isn't the same as admitting fault. And apology is the ultimate responsibility-avoiding word, as it means "talking away" (apo-logeo) blame from yourself. Obviously it must be linguistically impossible for an English speaker to apologize, because the words for admitting fault don't exist in English. And English doesn't have a word for "I hope you'll enjoy your food", which reflects on the blandness of la cuisine anglaise. un malpaso: "I die. O my hair falls out and my flesh rots and my bones are cracked by the hungry ta!a'an. He drops me behind him all around the forest and nothing will grow where his excrement from my marrow falls. As the years pass the forest dies from the poison of my remains. The soil washes into the sean and poisons the fish and all die. O the embarrassment." Joe Haldeman, "A !Tangled Web"
Some time ago, a few Chinese friends and I decided there was no Mandarin expression for "Excuse me" or "Excuse me, please". When we have to squeeze past a row of seats in the plane or theatre, we will make do with the expression "Sorry !" (dui-bu-qi 對不起）。But an older gentleman suggested the correct, and older, expression for "Excuse me" should be lao-jia, 勞駕 （literally "Trouble your gracious presence" ). I see that lao-jia 勞駕 is indeed translated "Excuse me" in an online Chinese-English dictionary. I think it's relevant to note that a quick web search reveals numerous articles in which people from the Philippines demand that Japan apologize for its actions in World War II. So evidently they have the concept of nation-to-nation apologies and have notions of what makes these adequate. "It seems to me that among English-speakers there has been a growing tendency over the last several years to focus on the surface semantics of apologies, and judge them not good enough if they have even the faintest whiff of blame-shifting"
That may be true, or we may have a recency illusion here. I know it's bugged me for decades that railroads tend to say, "There's a 30 minute delay. We apologize for any inconvenience this may have cause." Why hedge with "any" and "may have"? If the train is half an hour late, it's essentially certain that some people are inconvenienced, so why not come clean and apologize for "the inconvenience this has caused." Though informal, "my bad" is my favorite English apology. It's succinct and takes full responsibility. Thanks to Jerry Friedman for the reminder about the Joe Haldeman story. I've never seen more epic apologies. In English, we also use formally apologetic language as a polite/indirect/euphemistic way of making requests (i.e. saying "excuse me" or "sorry" while trying to squeeze past someone in tight quarters even if, frankly, they should have taken the initiative to get out of your way rather than saying "will you please let me through" or "get out of the way, doofus"). That may be in some abstract sense "insincere" but it's rather the opposite of an unapology. I recall being fuzzy as a child on the distinction in Japanese between "sumimasen" and "gomen nasai" (both of which I was taught meant more or less "excuse me") but internet sources suggest they actually make explicit a distinction which is often implicit in English with e.g. the first perhaps being what you say when trying to squeeze by someone under circumstances where you have a perfect right to do so but the second being what you say instead if you accidentally step on their foot while doing so. This seems to be an area where culture-specific notions of politeness etc. are going to be so thick on the ground that for any given pair of languages there may not be one to one mappings for a particular stock word/phrase. So it likewise seems like an area where it might be particularly likely for someone's uninformed reaction to a lack of one-to-one mapping to be "language A has no word for X." "I'm sorry" said to someone who lost a loved one expresses regret and contains no implication of fault on my part. Etymologically, of course, the more fundamental meaning is 'I'm sorrowful', and only secondarily does it mean specifically 'I'm sorrowful because of what I have done'. But clearly for many people 'sorry' has no use other than to accept blame, and for them the lack of a word with this specific function in other languages will no doubt be surprising. What contentious comments! Sorry seems to be the hardest word. Exactly. The English "Excuse me" can be used in a wide variety of situations. I don't think Mandarin "Lao-jia 勞駕“ can be used in all those situations, for instance, in "Please excuse me for not coming to class," or "Excuse me please" when you want to leave the dinner table. When walking in a crowd Americans say "Excuse me" after they collide with you. Brits say it as a warning that they will push you out of the way if you don't get out of the way. But then we also say "sorry" if someone else collides with us. Well, the main difference between English "I'm sorry" and "Excuse me" is that the latter apologizes for a rudeness in advance of or while committing it. In Turkish, the ordinary expression is the same in both cases, "Affedersiniz" literally "Please excuse". I don't see why there has to be separate words, necessarily. Ellen K. said, ""I'm sorry" said to someone who lost a loved one expresses regret and contains no implication of fault on my part." "any inconvenience this may have caused" v ""the inconvenience this has caused". I have recently been pondering the strong and weak uses of 'any'. I have been applying for jobs at universities in South Korea. I conclude my application letter with "I look forward to any communication from you regarding my application". Unfortunately, I get very few acknowledgements that they've even received my application, so I think maybe I should type "I look forward to *any* communication (at all!) from you". Sydney train station announcements used to be "The [time] train to [destination] has been cancelled for today only" (ie the driver didn't show up), thereby making no promises about tomorrow. The announcement is now "has been cancelled", which just might mean "always". Further to Julie Lee's comment, in my Mandarin classes in college, we learned 对不起 duìbùqǐ as the "one size fits all" translation of "I'm sorry", "excuse me", etc., though its literal meaning is something like "(I) can't face (you)" During my visits to the PRC, I have just as often heard 麻烦你 máfannǐ (" (May I) trouble you"). I have never encountered 劳驾. I wonder if has become somewhat out-of-fashion in more recent generations. Then there is 不好意思 bùhǎoyìsi. I hear this phrase more often than any other in situations when someone is apologizing. The literal meaning is something like "bad meaning", yet in this era 不好意思 seems to be the go-to phrase for apologies. Surprisingly enough, this isn't true: at least according to the OED, "sorry" is etymologically related to "sore" but not to "sorrow". Thanks for the information on usage in Mainland China of duibuqi 對不起 as a "one size fits all" for "Sorry" and "Excuse me". And for the info. that you are not encountering laojia 勞駕 for "Excuse me"。 And that buhaoyisi 不好意思 is used a lot. I haven't lived in Mainland China so was wondering about whether laojia勞駕 is widely used there. I've heard it used in Taiwan. But the Mandarin of Taiwan and that of Mainland China has diverged somewhat because of the decades of separation. I imagine there is a similar divergence in the German spoken in East and West Germany and in North and South Korea. I didn't mean to imply that 对不起 can be used in all situations, just that it was the one phrase we were taught. As a non-native speaker, my observations are probably suspect. But it seems that 对不起 maps most closely to "I'm sorry", 麻烦你 is closest to the "pardon me" one says before asking for something, and 不好意思 is what you say when you stumble into someone, step on their toes, burp, etc. I welcome critiques from native speakers from both sides of the Strait! means "I'm embarrassed" and serves as apology for bumping into someone, stepping on their toes, burping etc. Ma-fan-ni 麻烦你 means "(May I) bother you", and serves as "pardon me" before asking for something. "My understanding is that in Tagalog there is no way to "cross one's fingers behind one's back"; that is, every statement must be sincere." That seems perilously close to saying one cannot lie in Tagalog, which reminds me of the Noble Savage moment in the movie "Amistad" when the American lawyer is told there is no word for 'lie' in Mende. A fine jab at corrupt Westerners for dramatic purposes, but not a very sensible description of Mende or any other language. I remember being told in my Vietnamese classes (forty years ago) that the common phrases for "I'm sorry," "Thank you," and "You're welcome," were worn down from flowery equivalents that roughly translated as: "I beg your grace," "I have a debt," and "I would not dare." Not sure If I was accurately informed. That seems perilously close to saying one cannot lie in Tagalog, which reminds me of the Noble Savage moment in the movie "Amistad" when the American lawyer is told there is no word for 'lie' in Mende. It reminds me of the claim that I've read there are Australian languages in which there is no way to ask for something, because all exchange relationships are defined by kinship and everyone knows what should be given and received and to who and in what quantities beforehand, with everyone being looked after appropriately, without the necessity of having to ask. I think the intention of this is to contrast the fantasy of Noble Savage Socialism with our grasping devil-take-the-hindmost philosophy. Begging for forgiveness of sins is a fundamental purpose of prayer in many religions. How id this done in a language that does not allow admission of guilt? 1. Swedes are terribly impolite, since we have no word for please. 2. Swedes are terribly polite, since we say thank you all the time. "Ipagpaumanhin po ninyo ang aking pagkakamali." Norvin, that is some seriously formal grovelling. Somehow I can't imagine saying it in any other position besides kneeling abjectly on the ground before the wronged party, clothes perhaps rent in anguish. Then there's the fairly recent (???) "Excuse you! ", said in annoyance to someone who's bumped into you etc. without apologizing. Several times, I've said, "I'm sorry" to people who are having bad days, and they've replied, "Oh, you don't need to be sorry; it wasn't your fault." See my comment and others above. Deborah Tannen makes this a gender difference, but maybe this isn't (any longer?) the case. "Then there's the fairly recent (???) "Excuse you! ", said in annoyance to someone who's bumped into you etc. without apologizing." That goes back at least to the 1970s, since I remember it from elementary school. Isn't all this a bit like claiming that Italian has no word for tomato, because 'pomodoro' originally means 'golden apple'? "When walking in a crowd Americans say "Excuse me" after they collide with you. " ? Not the usage I've ever heard. "Excuse me" usually would be said in advance, asking someone to move so you could pass. Unfortunately, in some neighborhoods in NYC at least, the response is often a sarcastic "excuuuuse you!" A long-time NYC usage is to say "Watch your back." It means, from what I can gather, "I'm passing by you so don't be in my way when I get there," and is used even when the person saying it is passing in front of the other. Wouldn't this refuted by my saying, for example, "My name is Irving" in Tagalog? How could Tagalog, or any language, prevent me from saying such a thing? Or is the idea more subtle than that? Hm, this supposed tendency to use words which don't admit guilt for an apology is interesting to me. In Bulgarian, извинявай(те) literally means "absolve me of guilt", which implies there is guilt in the first place, but it's also used in situations when there is none. wanda: I'm young (reasonably), British, and male, and I routinely encounter and use 'I'm sorry' in its condolent sense. Sometimes I'll hear (or even myself say) 'Oh, it's not your fault' in response, but I always treat this as a sort of awkward 'thank you', or a way of acknowledging that the person saying sorry has made a special effort to be sympathetic. I've never noticed a gender divide in the use of this kind of sorry. Vasha: I don't think that Turkish would ordinarily use the same phrase in those two situations. 'I'm sorry' is normally expressed by 'özür dilerim' (lit. 'I beg your pardon') or 'kusura bakma(yın)' (lit. 'overlook [my] fault'), whereas 'affedersin(iz)' (lit. 'you will forgive [me]') is almost always reserved for 'excuse me'. Often, you'll hear 'pardon' for the 'excuse me' that one says when one is trying to get past someone in the way. In Istanbul, getting past someone will very likely entail an aggressive shove, which just goes to show that whether or not a language has lots of polite phrases doesn't reveal all that much about its speakers. Was being facetious re: Tagalog speakers as "truth-tellers"
I think Levantine is exactly right. You try to acknowledge the "I'm sorry" and your repertoire of responses consists only of treating it as an apology, even though you know full well it isn't. Oh, my apologies, JS. (I'm sorry, forgive me, my bad, etc.) I've come across the notion put forward in earnest, honest. In relation to evidentials, possibly.
" I've read there are Australian languages in which there is no way to ask for something, because all exchange relationships are defined by kinship and everyone knows what should be given and received and to who and in what quantities beforehand, with everyone being looked after,,,,:"
And all this is reflected in the language. As we know, modes and mores affect a language, which is why translation can be hard. JS, thanks for the additional apology phrases, some of which jogged my memory, some of which were new to me. Isn't baoqian also the typical phrase used when offering condolences? Then there is the non-apology 来， 来， 当心 Lái, lái, dāngxīn! I used to hear in my teacher days in Shanghai, when guys in delivery carts were coming up behind me and were in no mood to slow down! @Jason: the Indigenous language of the Sydney region has words for 'ask' and 'deceive' (Jackelin Troy, 1994, citing British writers recording the language during the early settlement/colonisation/invasion period). @Rodger C, Doug: Google ngrams has 'excuse you' from 1800. Without context it's impossible to know whether that's in the same sense as you are meaning. I can think of strings such as 'without any excuse, you (did sth objectionable)' where those words appear together with another meaning. In Spanish are used both the first and the second person. We can say "Lo siento" (something like "I regret it") or "Perdona" ("Forgive me"). It doesn't make any difference. Indeed, I hadn't realised that until now. Leonardo: I just realised that beside извинявай "absolve me of guilt" in Bulgarian there is also съжалявам "I share your grief" which can be used as an apology without admitting blame, beside in its more straightforward meaning. Indeed with the proper tone it can be a more serious apology, despite etymology. @David Morris: Or simply, "I shall excuse you this time." @Doug: Well, the 1970s, which is after I (allegedly) grew up, is recent enough for me. The concept of apology actually covers a lot of ground. Responsibility: I was the one who did it. Wrongness of the act: What I did was wrong. Remorse: I feel bad about what I did. Recognition of harm to others. Someone else suffered because of what I did. So a simple speech act like "I apologize" covers a lot of ground. It seems silly to say that because a particular phrase doesn't cover all of this ground semantically it doesn't count pragmatically as an apology (as in the original article). In American English, the way "excuse me" or "sorry" is said affects the meaning a lot. I think this is true of other words and phrases in English that are used for social interaction in ways that aren't obvious from the surface meaning of the words, such as "how are you" or "good to see you" or "please." It seems to me that intonation is a big feature of the meaning of these social politenesses, but intonation isn't as commonly as important (or perhaps not used as much?) in ordinary conversation. Saying "He walked down the street" doesn't necessarily contain social cues through intonation, but other phrases can be neutral, friendly or sarcastic depending on intonation independent of the wording. Intonation can make a big difference when someone says "please pass the potatoes," "sorry, buddy," or "well, excuuuse me." Do native speakers of English focus more on the way these things are said than their surface appearance or is any deviation from neutral intonation a signal for additional social cues? (I'm sure there must be more accurate terms for these processes, but unfortunately I don't know them.) And are things like a sarcastic tone used for "excuse me" universally recognized even by nonnative speakers or are there languages where what an American would call a sarcastic tone just isn't used or heard? It does sound to me as though the issue of apologies from the Philippines to Hong Kong is not so much an issue of Tagalog vocabulary as the difference between expectations in Hong Kong and Philippine incomprehension or unwillingness to meet the nuances of those expectations. Trying to paper over those difficulties by claiming linguistic differences are at work doesn't solve the conflict. @V: "In Bulgarian, извинявай(те) literally means "absolve me of guilt""
This is also the case with Portuguese "desculpa". English "excuse me" is not very far from that, either. "Wouldn’t “dinaramdam ko na …….” be more heartfelt ?"